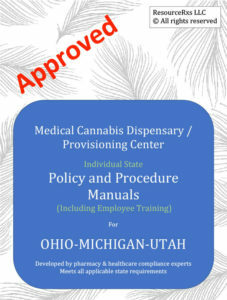 Medical Cannabis Dispensary / Provisioning Center policy manuals are available for your state. With more than 350 pages per manual, the documentation meets every state regulation requirement including employee training. Developed by pharmacy and healthcare compliance experts. Please fill out this form to receive more information and pricing.